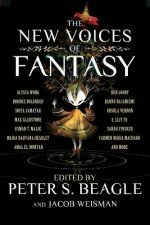 anthology The New Voices of Fantasy, Peter S. Beagle & Jacob Weisman, eds. anthology Dreaming in the Dark, Jack Dann, ed. anthology She Walks in Shadows, Silvia Moreno-Garcia & Paula R. Stiles, eds. anthology Monstrous Affections, Kelly Link & Gavin J. Grant, eds. anthology Dangerous Women, George R. R. Martin & Gardner Dozois, eds. anthology Postscripts #28/#29: Exotic Gothic 4, Danel Olson, ed. anthology My Mother, She Killed Me, My Father, He Ate Me, Kate Bernheimer, ed. anthology American Fantastic Tales: Terror and the Uncanny: From Poe to the Pulps/From the 1940s to Now, Peter Straub, ed. anthology Paper Cities: An Anthology of Urban Fantasy, Ekaterina Sedia, ed. anthology Salon Fantastique, Ellen Datlow & Terri Windling, eds. anthology The Fair Folk, Marvin Kaye, ed. anthology (tie) Dark Matter: Reading the Bones, Sheree R. Thomas, ed. anthology (tie) Acquainted with the Night, Barbara Roden & Christopher Roden, eds. anthology Strange Tales, Rosalie Parker, ed. anthology (tie) The Green Man: Tales from the Mythic Forest, Ellen Datlow & Terri Windling, eds. anthology (tie) Leviathan, Volume Three, Jeff VanderMeer & Forrest Aguirre, eds. anthology The Museum of Horrors, Dennis Etchison, ed. anthology Dark Matter: A Century of Speculative Fiction from the African Diaspora, Sheree R. Thomas, ed. anthology Silver Birch, Blood Moon, Ellen Datlow & Terri Windling, eds. anthology Dreaming Down-Under, Jack Dann & Janeen Webb, eds. anthology Bending the Landscape: Fantasy, Nicola Griffith & Stephen Pagel, eds. anthology Starlight 1, Patrick Nielsen Hayden, ed. anthology The Penguin Book of Modern Fantasy by Women, A. Susan Williams & Richard Glyn Jones, eds. anthology Little Deaths, Ellen Datlow, ed. special award, non-professional Bryan Cholfin, for Broken Mirrors Press; Crank! anthology Full Spectrum 4, Lou Aronica, Amy Stout & Betsy Mitchell, eds. anthology MetaHorror, Dennis Etchison, ed. anthology The Year's Best Fantasy and Horror: Fourth Annual Collection, Ellen Datlow & Terri Windling, eds. anthology Best New Horror, Stephen Jones & Ramsey Campbell, eds. anthology The Year's Best Fantasy: Second Annual Collection, Ellen Datlow & Terri Windling, eds. anthology The Year's Best Fantasy: First Annual Collection, Ellen Datlow & Terri Windling, eds. anthology (tie) The Dark Descent, David G. Hartwell, ed. anthology (tie) The Architecture of Fear, Kathryn Cramer & Peter D. Pautz, eds. collection/anthology Tales of the Quintana Roo, James Tiptree, Jr.
collection/anthology Imaginary Lands, Robin McKinley, ed. anthology/collection Nightmare Seasons, Charles L. Grant, ed. anthology/collection Elsewhere, Terri Windling & Mark Alan Arnold, eds. anthology/collection Dark Forces, Kirby McCauley, ed. anthology/collection Amazons!, Jessica Amanda Salmonson, ed. collection/anthology Shadows, Charles L. Grant, ed. collection/anthology Frights, Kirby McCauley, ed. special award, professional Shelley Torgeson & Roy Torgeson, for Alternate World Recordings, Inc.